In a small bowl, mix together paprika, brown sugar, chili powder, garlic powder, cayenne pepper and salt. Rub spice mixture on all sides of the steak. Refrigerate steak for 20-30 minutes. Pre-Heat BBQ Grill to medium/high. If your grill has a searing section, sear the steak for about 1 minute each side. Transfer to the regular grill rack and grill about 4-5 minutes on each side over medium/high heat with the lid closed. This should end up medium to medium/well doneness. Place finished steak on a platter and cover with foil. Let it stand for 5 minutes. 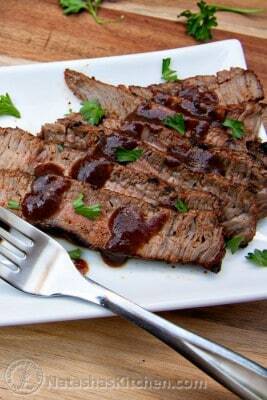 Cut steak across the grain into thin slices and serve with A1 Steak Sauce. Costco has the best top sirloin and the best prices too, especially if you need alot for a party. I usually cut those in half because they are such thick steaks.